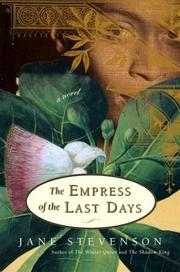 Last in an ambitious trilogy about a queen and a former slave fast-forwards to the present: here, a newly discovered cache of documents suggests that a black Barbadian woman may be the true queen of England. Deftly mixing scholarship and history, Stevenson (The Winter Queen, 2002; The Shadow King, 2003) creates a tale rich in ironies and send-ups of academic intransigence as she continues the story of Queen Elizabeth of Bohemia, sister of Charles I of England. In exile in Holland, in 1639, Elizabeth married Pelagius, a freed but once-enslaved African prince, and the next year, she gave birth to a son, Balthasar. Now, in present-day Holland, historian Corinne is having trouble not only with her department head but also with finishing her dissertation, not to mention worries that she may not get a teaching job. In England, Michael is teaching English at Oxford but is bored as well, and tired of college politics. He and Corinne once dated, so when she’s alerted to the discovery of 17th-century documents that include a copy of a play by Aphra Behn, the first British woman playwright, she contacts Michael. Interested, Michael visits her in Holland, carries off the relevant documents, and is soon as absorbed as Corinne in the story of Elizabeth and Pelagius. He learns that the couple’s son lived in London, visited Barbados, and wrote a botanical treatise, and that their grandson, Theodore Stuart, married Godscall Palaeologue, the daughter of the last heir to the Byzantine throne. The Palaeologues settled in Barbados, and Michael now discovers that a Dr. Palaeologue is teaching at the university there. While Corinne fights on in academia, Michael heads for Barbados. There, the doctor turns out to be a comely young black woman called Melita, who warms more to Michael than to the notion that she is the true heir—a Stuart, not a Windsor—to the British throne in fulfillment of an ancient prophecy. Agreeable historical fiction that both informs and entertains.